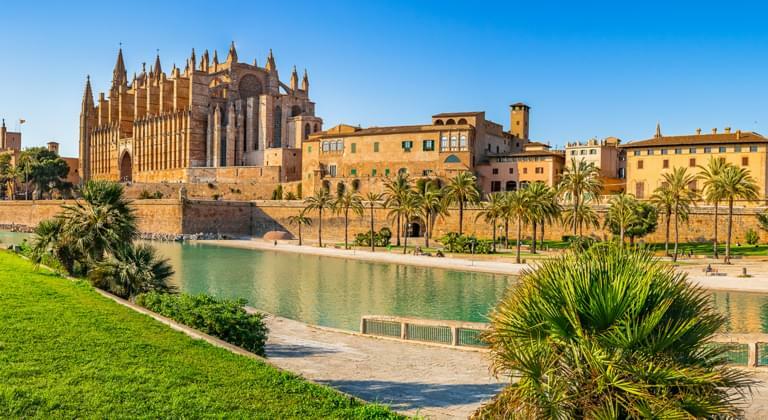 Palma de Majorca, the capital of the Spanish Mediterranean island of Majorca and seat of the autonomous government of the Balearic Islands, is a well-known holiday destination for many European tourists. The island of Majorca itself is often associated with sun, beaches and parties. However, Palma de Majorca offers much, much more. Therefore, you should not spend your holiday only at the beach, when in the city and its charming surroundings, there is so much to discover. So, if you want to explore as much as possible of Palma de Majorca, as well as its surroundings and attractions, it is advisable to book a rental car. With Driveboo, you will be able to compare offers of many different rental car companies and choose the one that meets your requirements. Explore the wonderful area around Palma de Majorca. Boulevard in Palma de Majorca. Palma de Majorca Airport (PMI) is the third largest airport in Spain. Stations of various car rental companies are available directly at the airport, so that you can pick up your rental car right after arrival and start your Spanish vacation. The capital of Majorca is just nine kilometers away. Especially in the summer months, when many holidaymakers want to book a rental car, book your rental car for Palma de Majorca on Driveboo in advance. You will save on the booking and get better deals than would be possible on site. Timely and good planning is always the safest option. All car rental companies in Spain offer insurance for their vehicles. You should always opt for the insurance for your own protection. Definitely advisable is to choose a full insurance without non-waivable excess. In Spain, rental cars are also required to have fire insurance and third-party liability insurance coverage. What are the speed limits on Majorca? Explore Palma de Majorca with your rental car. Type of road Maximum speed Motorway 120 km/h, Standard road 100 km/h or 90 km/h and Built-up areas 50 km/h. The legal blood alcohol content is 0.05% (breath alcohol content: 0.25 mg/l), and 0.03% (breath alcohol content: 0.15 mg/l) for drivers with less than two years of experience. What emergency numbers should I know when renting a car in Palma de Majorca? Book a cheap rental car and explore Palma de Majorca. A trip around the town of Palma de Majorca is much easier and more convenient when using a rental car. 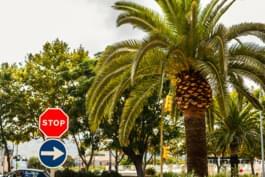 While driving in Palma de Majorca with a rental car, you will be able to enjoy a ride along the streets lined with palm trees. You could rent a convertible to make the experience even more exciting. Visitors to Palma de Majorca must not miss the old town. Its manorial houses convey a Mediterranean flair that fascinates visitors of the three Balearic Islands of Majorca, Ibiza and Menorca. Many former palaces have now become charming apartments and hotels. Tourists who book a room here can count on unforgettable charm and flair. There is also a total of 31 churches here. Most of them have been built in Gothic style. Also worth seeing is the town hall of Palma de Majorca. Its façade is adorned by rich decorative details from the Baroque and Renaissance periods. A popular photo opportunity is the dark roof of the town hall, with its carved figures. During a holiday in Majorca, you may want to escape the hustle and bustle of the capital city. If this is the case, you can simply take your rental car and drive across the island to some more remote beaches. Admittedly, there are hardly any empty beaches on Majorca. However, you can find some areas to relax in a more undisturbed manner. These are easily accessible with a rental car. 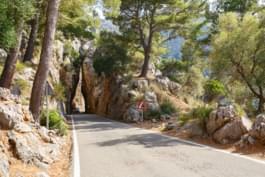 An advantage about driving around Majorca is that the excursion destinations can usually be reached in a manageable driving time. While travelling with a rental car, you will never need more than max. 1-1.5 hours to reach any given destination on the island. Day trips on Majorca are perfect for some quiet days on the beach. An example of a beautiful bay is Cala Figuera, in the north of the island. The area has been almost undiscovered by tourists. It is located at the end of the tangent between Palma in the south and Port de Pollenca in the north. It can therefore take some time to get there, but it is well worth the drive. In less than an hour you will reach the small bay and will be able relax in peace on the beach. It's great fun to book a rental car and visit the somewhat rough but quieter North. Places that are also worth seeing are Cap Formentor or Cala Murta. Routes leading there are curvy; this prevents some tourists from taking a drive with a rental car. However, you should not be afraid to get past this obstacle and enjoy some of the most beautiful places on the island.